Russia’s iconic weapons manufacturer Kalashnikov is currently working on 30 major projects. The company has plans to break into new markets in Africa, Latin America and Asia. Russian weapons manufacturer Kalashnikov has undergone a massive rebranding operation, revamping all of its brands, from Kalashnikov military weapons to Baikal hunting arms and Izhmash sporting weapons. Altogether, 20 million rubles ($394,000) have been spent on the rebranding drive, with the costs being shouldered by private investors and Kalashnikov co-owners Alexei Krivoruchko and Andrei Bokarev. 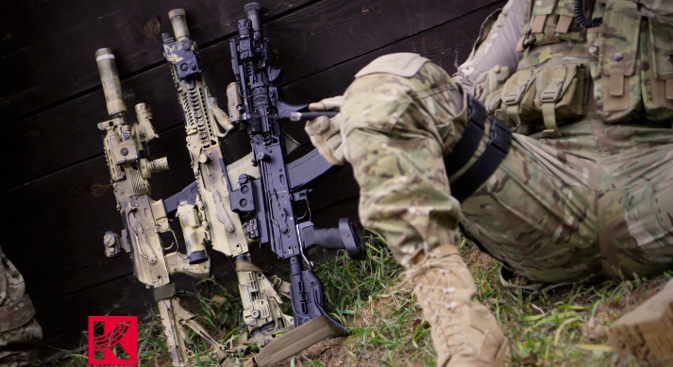 The Kalashnikov line of military gear has undergone significant branding changes. The stylized silhouette of the letters ‘AK’ on a red, white, and blue background has been scrapped for the letter ‘K’ on a red background. Part of the letter ‘K’ in the new logo is drawn in the form of the rifle’s most recognizable feature – its magazine. Spokespeople for the state-run corporation Rostec, which includes the Kalashnikov concern, said the new logo is a reinterpretation and preservation of all the symbolism that the Kalashnikov name captures. Kalashnikov’s philosophy is reflected in its new slogan, “Protecting Peace.” The developers of the new slogan wanted to insinuate a double meaning (in Russian, the slogan is “Oruzhie Mira” - the word mir means both ‘peace’ and ‘world’ in Russian). According to them, Kalashnikov weapons are the world’s most widely-produced, exceeding the number of arms produced by rivals several times over. “This rebranding reflects the concern’s key principles: reliability, responsibility, and workability,” CEO of the Kalashnikov Concern Alexei Krivoruchko told reporters. Rebranding for military weapons is an element of Kalashnikov’s new development strategy until 2020. The manufacturer has ambitious plans, including new kinds of firearms and entry onto new markets. Its design bureau is currently working on 30 major projects on a full range of arms, from new sniper rifles to pistols. The most interesting of Kalashnikov’s new military developments is the AK-12 rifle. This is the fifth generation of the “Kalashnikov system,” with the same gas-operated long-stroke piston system used by all the Kalashnikov rifles, historian and firearms expert Semyon Fedoseyev told RIR. Compared to its predecessors, the AK-12 is ergonomically more flexible, with an ambidextrous ejection port and reversible cocking handle above the vertical foregrip. The new rifle also has adaptations that make it quicker to get the weapon ready for firing when changing the magazine, Fedoseyev explained. The contours of the rifle are also smoother than the previous Kalashnikov generations. There is a stock latch on the stock itself, which allows it to be folded to either side of the AK-12. The stock can be permanently replaced and is adjustable. The rifle also offers a more ergonomic pistol grip. As a result, the weapon has a longer service life, while preserving the legendary reliability of Kalashnikov rifles, Fedoseyev told RIR. The AK-12 is currently undergoing government testing. In the future, it could become the primary rifle for the Ratnik “soldier of the future” combat gear, which is currently being developed in Russia. Kalashnikov’s ‘civilian lineup’ is no less remarkable for its assortment of hunting and sporting weaponry created on the basis of the Kalashnikov military rifles, of which the Saiga semi-automatic hunting rifle is just one example. Kalashnikov’s civilian product line has also been rebranded. Its hunting arms are still branded with the Baikal logo in blue and white tones, but the sporting rifles and pistols will be manufactured under the Izhmash brand name, written in Latin letters. Kalashnikov has traditionally focused its sales in the Western hemisphere. Its civilian arms used to enjoy high popularity in the United States and Canada, but the sanctions against Russia have closed those markets. As a result, the arms producer has been forced to pivot towards other regions, tripling exports this year in comparison with 2012. And that is without taking the U.S. and Canadian markets into account. Negotiations are under way with Africa, Latin America, and the Asia-Pacific region. At the end of November, Kalashnikov announced its entry onto the South-East Asian market with the signing of an agreement to deliver civilian products to Thailand and Malaysia. Because of these new contracts, Kalashnikov has been able to compensate for its losses from the sanctions and even to expand its presence on the global arms market, Rostec said in a press release.